After accessing the elevator at the end of Dragon's Sanctum that can take you up two levels, the top being the beginning of the Shulva, while the middle will lead to the Dragon's Rest after climbing the massive staircase. Once you have, you will need to reach the bottom of the area. Head out the door you arrived from, and then right until you reach another broken bridge. Drop onto the broken pillar then onto the next platform below. Take the stairs that lead to the next platform, and head straight until you find a body holding 10x Hexing Urn. Around the corner you'll find another Drakeblood Knight. Deal with him then jump down the broken staircase on the right, and take the next flight down again. At the bottom, continue along the path and turn left. 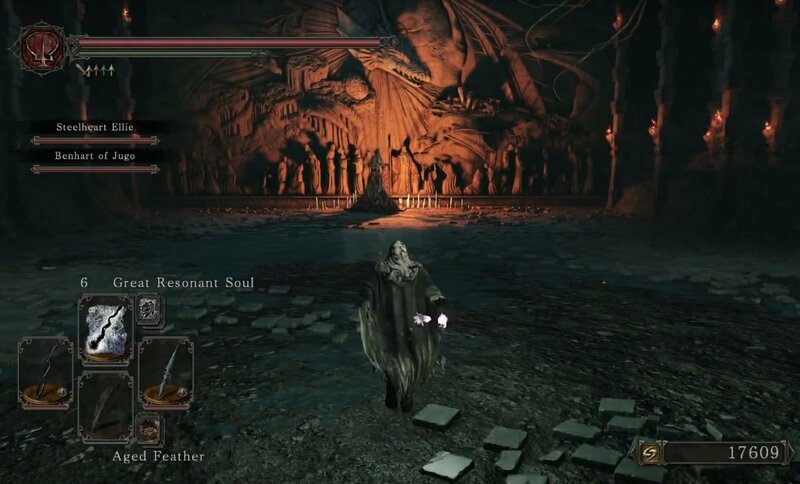 Take another left and in the middle of the left corridor wall, press the "use" button to unlock an illusory wall, concealing a bonfire inside, the Sanctum Interior bonfire. When you're ready, continue in the same direction you were heading, to find a set of downward stairs, and two more Drakeblood Knights. Turn left and again left and you'll find a room with several chest that are already open. There will be a body holding the Drakeblood Set. Head out and turn right, go back to where you found the hidden bonfire, after the bonfire turn right and go straight until you see another broken bridge on the left. Drop down here, then down some steps, drop down again. Drop down once more to find an area you can jump to on the left, so run and jump there. 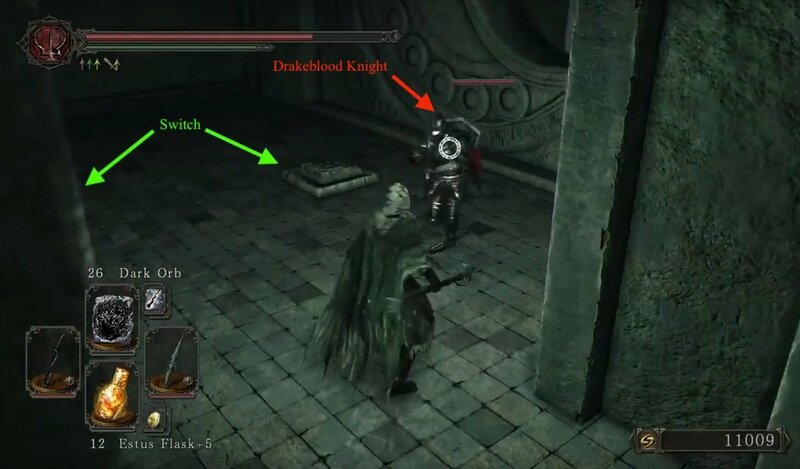 Turn right then left to find an item glowing on a body, don't rush it as there are two Drakeblood Knights nearby. Kill the first then pick it up -3x Vine Balm. Turn the corner again to find body numero two with 3x Twinkling Titanite. Further down will be another Knight standing between you, and two more bodies holding a Large Soul of a Brave Warrior and 3x Twinkling Titanite. Turn left from the last body to find another one holding 5x Small Smooth & Silky Stone. Turn left and continue forward until you come across a dead end. Here you will find an area you can jump down to, on the right side. From this platform, drop down and continue to do so until you are prompted with the "Dragon's Rest" title. Here you will see a large fog gate that leads to the first boss fight. If you require assistance with the boss, the summon signs for Benhart of Jugo, and Steelheart Ellie, can be found in this area. 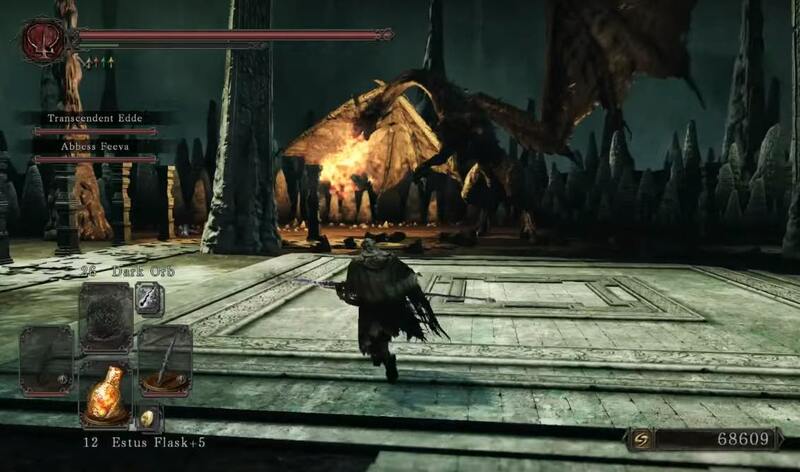 After you defeat Elana and acquire her soul (which can be exchanged for the Wrathful Axe at Weaponsmith Ornifex), the wall adorned with a giant dragon opens, revealing a passage. Continue through here to arrive at a bonfire, the Sanctum Nadir bonfire. Now you stand before a smaller fog gate. On either side of the bonfire, you'll find summon signs for Abbess Feeva, and Transcendent Edde. Through the fog gate is a large open area, where you must now fight the second boss of the Rest. Boss Fight: Sinh, the Slumbering Dragon. 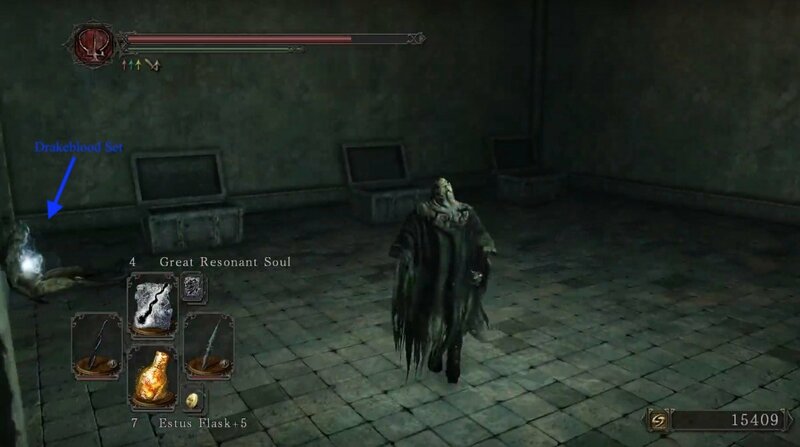 After defeating him -well done- you will obtain his soul (which can also be traded for the Yorgh's Spear at Weaponsmith Ornifex), you should also see a glimmering orb on the floor. Examining it will grant you the Crown of the Sunken King. On the left side there will be a body with an item, head there and pick up the Yorgh's Ring.